A web application designed to improve the donation experience for one of the world’s largest transplant registries to support their growing global presence. 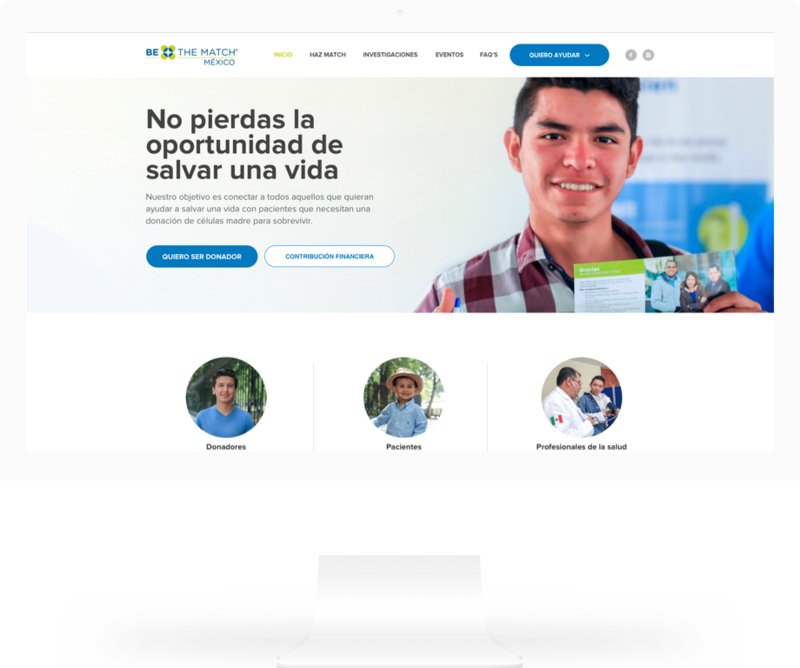 Nolte partnered with Be The Match® Mexico to elevate the functionality of their website by integrating a payment platform, a CRM and improve the user experience through validated design. Over the past 30 years Be The Match®, has managed the largest and most diverse marrow registry in the world. In 2017, they opened their first offices in Mexico City to give the Mexican public access to the registry. As part of their mission, they work every day to save lives through transplants. 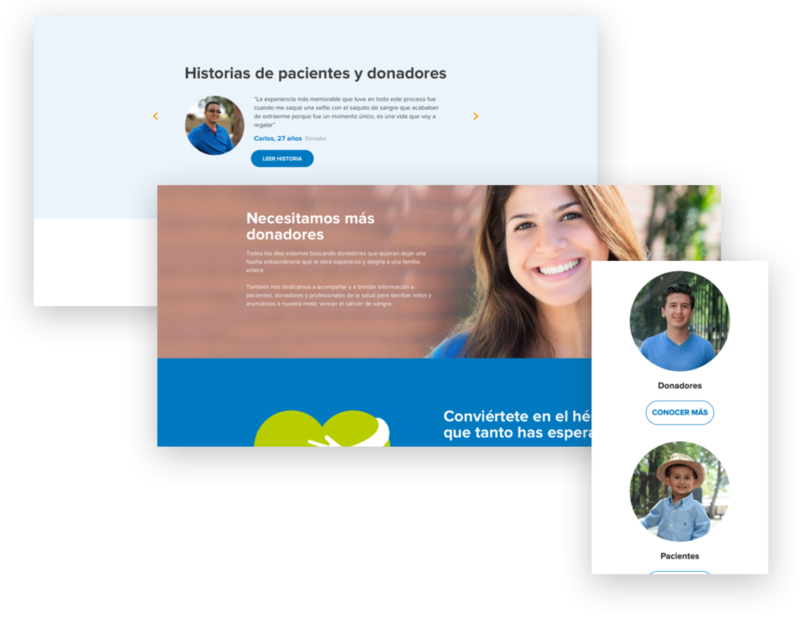 In order to do so, the Be The Match Mexico® team realized that changes needed to be made to the homepage and donation sections of their website to facilitate their objectives. Furthermore, an online payment platform and CRM needed to be included for their growth initiatives. 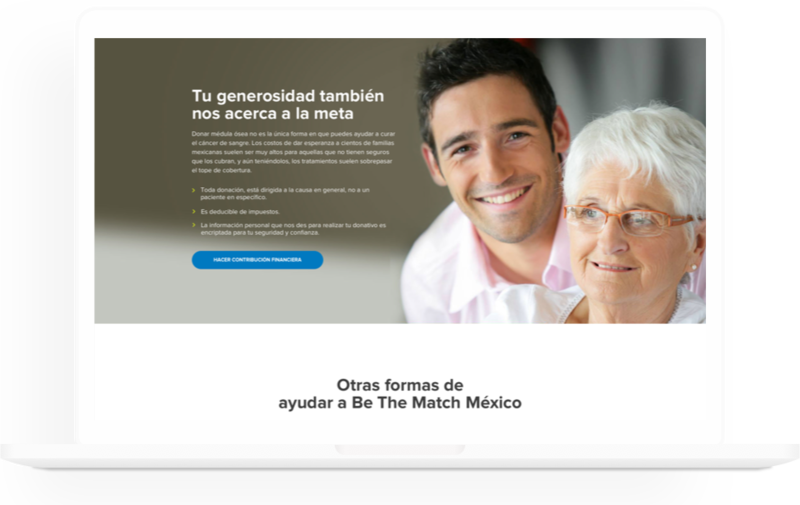 The Be The Match® Mexico team needed an improved user experience for both their homepage and donations pages. In addition to having certain coding issues causing backend problems, certain sections of the existing site were hardcoded taking away a considerable amount of autonomy and flexibility from the Be The Match® Mexico team. This specifically made content management a difficult task for them. Furthermore, the previous site had no payment system integration to allow their contributors an easy option for making their monetary donations, nor was there any automated Customer Relationship Management (CRM) tool to manage donor interactions. Working together with the Be the Match® Mexico team we applied agile methodologies to manage the product. The project was divided into 2 phases, the first to incorporate BanWire a payments API. Second, the redesign of the user experience for the home and donations pages, not to mention incorporation of a cloud-based CRM. This took place over a period of two weeks divided into two 1 week Sprints. Throughout this process, we worked closely with Kenza Gravois the Be the Match® Mexico Marketing Manager, who served not only as the product owner from their side but also as the subject matter expert in the field of non-profit organizations. During the process, the Nolte and Be the Match® Mexico teams held check-ins at least once a week to confirm alignment of the work being done on the deliverables. We also worked in tandem with BanWire, a Mexico based payment platform to successfully integrate their API with the website. Furthermore, Nolte as a registered HubSpot partner was able to integrate and assist with the setup of Be the Match® Mexico’s CRM. 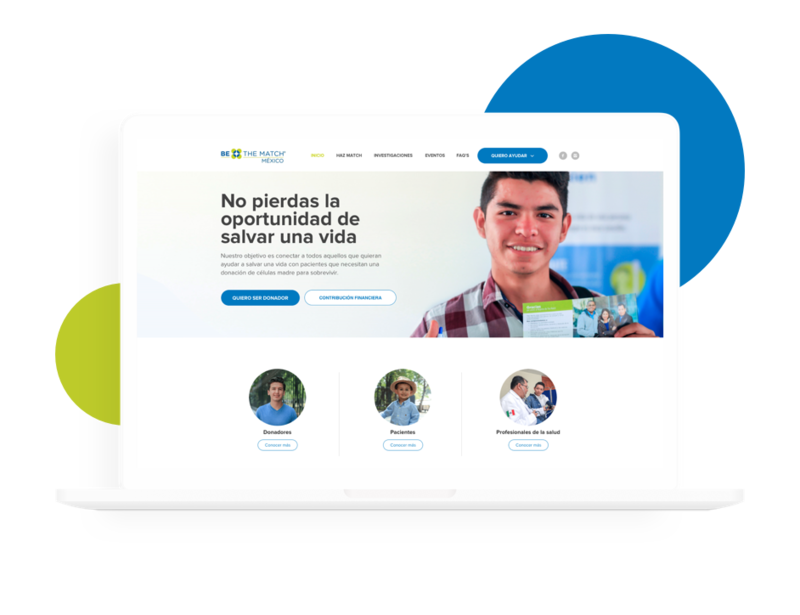 As a result, we were able to hand over a fully functional payment platform API integration, CRM and a considerably improved User Experience of two of the most important pages on the Be the Match® Mexico website. This relationship led to the delivery of a product that met the goals set out at the beginning of the project. Nolte used WordPress to power the solution for Be the Match® Mexico. Both teams worked closely together, with Nolte guiding the development of the User Experience strategy and integration of both the BanWire payment platform and HubSpot CRM. To make the experience as painless as possible for the Be the Match® Mexico team, Nolte simultaneously led the technical discussions with the BanWire team to ensure successful integration and collaboratively defined the ideal means to include the CRM into the Be the Match® experience workflow. In addition, deliverables for the homepage and donation pages included, user personas, user flows, sitemaps and wireframes developed in the prototyping software inVision. The user experience was validated through userfeel.com, a remote usability testing tool which includes Mexican beta users. 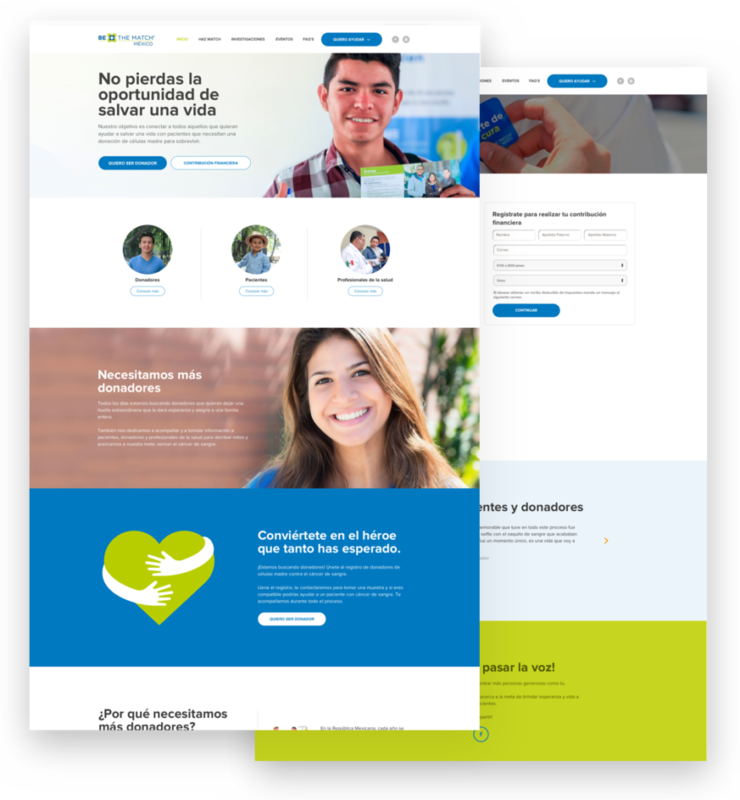 Be the Match® Mexico now has an improved online presence and a functional web application which allows them to receive monetary donations from sponsors, offers them a clear and easy-to-navigate interface on both the home and donations pages. In addition, the website is now fully integrated with a cloud-based CRM which will support their emailing campaigns and overall targeted marketing strategies. The BanWire project was really well executed. The Nolte Care team have been great and we are pleased with the way in which they support us with optimizing our budget.